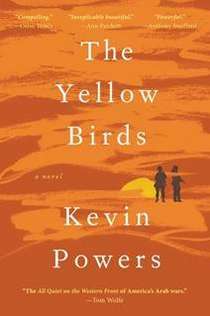 I’ve been putting off writing a review of The Yellow Birds, Kevin Powers’ novel about the Iraq war. It was a finalist for the National Book Awards, and one of the The New York Times Ten Best Books of 2012. I feel conflicted about it. In some ways it is a stunning book; and yet by the end I felt it was seriously flawed. I feel both guilty and insecure about my assessment. I see on the dust jacket the high praise it has garnered from writers like Alice Sebold, Colm Toibin, Anthony Swofford, and Philip Caputo. A novel on the Iraq war that is as ambitious and literary as this one should be touted, so why not just let it go at that? Yet I can’t get over the feeling that there is something too—too what? Too literary at times (can’t believe I’m saying that), too self-consciously ambitious, too straining for significance in a way that I think ultimately harms the book. The war in Iraq was so horrible, such an infuriating and heartbreaking mistake, so costly to so many, that I understand Powers’ desire to capture that. I can imagine how fiercely he wants us who were untouched by the war to get what it was like, what it meant, and the devastating damage it did to those who fought. All that is in the book, often brilliantly. So I’m surprised and troubled that I can’t give it the bowled-over endorsement I was expecting to. The Yellow Birds is described on the dust jacket as “the story of two soldiers trying to stay alive.” The narrator is a twenty-one year old private, Bartle, and the even younger soldier, Murphy, whom he befriends and takes on as a responsibility, promising Murphy’s mother that he’ll bring him safely home. The setting is the city of Al Tafar, a hellhole battleground that is the martial equivalent of the myth of Sisyphus. I have to say that the novel is truly an amazing rendition of the horror of the war, and what the rest of us can only dimly imagine as the nightmare existence of an American soldier there. The war tried to kill us in the spring. As grass greened the plains of Nineveh and the weather warmed, we patrolled the low-slung hills beyond the cities and towns. We moved over them and through the tall grass on faith, kneading paths into the windswept growth like pioneers. While we slept, the war rubbed its thousand ribs against the ground in prayer. When we pressed onward though exhaustion, its eyes were white and open in the dark. While we ate, the war fasted, fed by its own deprivation. It made love and gave birth and spread through fire. When I read that passage, I was thrilled by the remarkable writing, poetry in prose. Much of the book sustains the promise of those opening lines. The strength of the writing is often juxtaposed with the brutality of the situation, creating a dual perspective where one is exposed to awful occurrences captured in often striking descriptions. And they did come, shadowed in windows. They came out from behind woven prayer rugs and fired off bursts and the bullets whipped past and we’d duck and listen as they smacked against the concrete and mud-brick and little pieces flew in every direction. They ran through trash-strewn alleys, past burning drums and plastic blowing like clumps of thistle over the ancient cobblestones. The detail of the potted plant, so innocent and domestic, in conjunction with a bullet ending a man’s life, is typical of the way Powers is able to make the fighting and killing vivid and original. I did feel at times, however, that things had a familiar feel, as if I’d seen it all before. And of course I had, numbed by all the media coverage of war in Iraq, Afghanistan, and now Syria. Yet I was really hungry to get close to the Iraq war, to know what our soldiers actually experienced, as if it were my responsibility. There were many times when the novel accomplished that for me, breaking through my war fatigue. I read with a kind of avid interest, pain, and admiration, especially in the first half. The novel braids two story lines in alternating chapters, told retrospectively by Bartle. The first is Bartle’s and Murphy’s experiences as soldiers in Al Tafar in 2004. The other is Bartle’s return to his mother’s home in Richmond, Virginia, as he tries to adjust to life after Iraq, and grapples with what happened to Murphy and his own role in the aftermath. I’m not sure at what point I began to have some trouble with the novel. I think it was a combination of the developing plot and the way Powers sometimes seemed to be trying too hard to be profound, to inflate the language or reflections beyond what was needed or what they could support. The material itself was certainly powerful and emotional. But I began to feel that Powers was grabbing me by the lapels, shaking me and shouting at me to see how devastating all this had been, how awful, how the war had killed and destroyed its own men, until I felt myself pull back. The novel felt too over-the-top, which made me resist it. But is that a fair criticism, when something IS over the top?
. . . in a moment of weakness his mother would turn up the lid of the casket and see her son . . ., see what had been done to him, and he would be buried and forgotten by all but her, as she sat alone in her rocking chair in the Appalachians long into every evening, forgetting herself, no longer bathing, no longer sleeping, the ashes of the cigarettes she smoked becoming long and seeming always about to fall to her feet. And we’d remember too, because we would have had the chance to change it. Reading that, I doubted the mother would have the opportunity to view the body. Given what had occurred, I had to assume it would be a sealed casket. So I fell out of the whole justification for a crucial plot element. I found the writing “. . . as she sat alone in her rocking chair . . . long into every evening, no longer bathing, no longer sleeping . . .” to be unnecessarily sentimental and melodramatic. Now, writing this, it occurs to me that maybe the decision not to return the body was an indication of Bartle’s altered state, given the horror and trauma he’s experienced. But I didn’t think of that when I was reading it, and it doesn’t seem that’s what the author intended. I’m not sure. But I came to feel that the plot was forced and inflated. Beyond that, some of Bartle’s reflections began to be seem pretentious, calculatingly “heavy.” Given material inherently so emotional and powerful, maybe a little more restraint would have served him better. Writing this, musing about it, I realize that maybe my feeling have to do with the fact that the book is a novel, not a memoir. I came to feel that what I was getting was too fictionalized. It’s a peculiar thing to say, in that I think novels are a great way to render the truth. But in this case, maybe I wanted my war straight, not dramatized in a way that began to feel artificial to me. All that said, even belabored, The Yellow Birds is a powerful and important work, I think, in the same way Hemingway’s In Our Time and Tim O’Brien’s The Things They Carried are. It is certainly a graphic testament to the pain of war. It may be that the author felt he had to pump it up to shake us out of our ignorance and complacency. Or maybe to him it wasn’t inflated at all. I suspect many readers have reacted more positively to the book than I did. I feel badly about criticizing it; the fault may lie with me. Now I’m looking forward to reading reviews of it, to get others’ reactions, and hearing what you thought of it. A fair review. I admired the novel and it got an honorable mention, more or less, on my year end best books list. I loved its lyricism but also reacted somewhat leerily to its stagey overblown undercurrents, maybe just the calculated domestic thread. I also thought it might have made a good memoir, though he must've felt his own experience wasn't dramatic enough. Now that memoirs have reached parity with novels, though, it's an interesting question in any situation as to which might render the more resonant and truthful message. Richard, it's always wonderful to hear your intelligent, thoughtful, considered thoughts. It's interesting to me that the plot was what spoiled the book somewhat for me — which wouldn't have been the case with a memoir. He does write lyrically and there is much to admire. But there was a kind of "look, Ma, I'm writing" quality to it. It was a hard review to write, because it is so much better than most stuff, and also because it's received such attention and praise, a lot of it deserving. Thanks for your words — especially "stagey overblown undercurrents"! Very legitimate reservations, I think. thank you for your response, Diane. I find it a lot easier to review books that I DON'T have any reservations about — or not review them at all if I truly dislike them or can't find anything positive to say about them. After all, I know how hard it is to write a book. Was the truth in the letter, and was the letter sent to Murph's mother? How did the truth come out that he was brought up on charges? I'm still reading the book, but have been wanting to stop since I started. I don't pretend to be a sophisticated reader, so the book might just be an art too high for me. It's probably just not what I prefer stylistically. I'm a third of the way into it and I'm still grasping for someone to care about. I think I probably would have liked this a lot more as a memoir. As a novel it seems forced to me. But it does feel odd to disagree with all the rave reviews. Makes me think I'm not "getting" it.